The recipe calls for snails, of course, and wild garlic capers, juniper berries, nettles, thyme and woodruff sprigs, button mushrooms, morels, porcini, small chanterelles, cucumbers, onions, carrots, leeks, venison loin, fiddlehead ferns, forest moss, hop shoots, vine leaves, pickled beech leaves, large chickweed sprigs, and then butter, grape seed oil, salt, egg whites, birch wine. 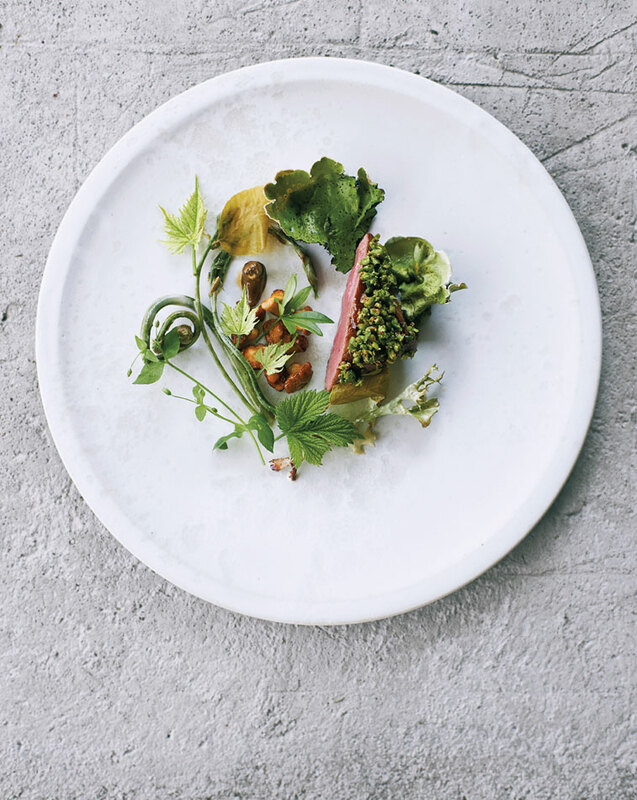 The plating raises the curtain on chargrilled baby cucumbers on one side of a plate, glazed venison and snails enter, fried chanterelles and thyme make their appearance, with the leaves, sprigs and mushroom sauce topping this theatrical forest floor. The journal entry, ingredients and plating suggest poetry with their specificity and range. Consider Seamus Heaney’s poem Digging.